To get a better idea of Kreezalid, what better than to try it? Being an online marketplace owner, your primary purpose should be to attract quality suppliers and allow them to showcase their offerings. It is because these sellers are probably already active and sell their products on other marketplaces. So what you can do to attract these sellers to sell on your marketplace is obviously to make their selling activities easier while putting their offers online and to provide them with some extra facilities such as how to set up a good listing form to increase sales on a marketplace. Actually, a good listing form allows the sellers to promote their products to potential customers. It is the main way that consumers discover sellers’ offerings. Keep in mind that an attractive looking listing form is a plus point for the success of your vendors on your marketplace and, therefore, for your success. Here are 3 tips for you which will allow you to create an effective and more convenient listing form to fill in for your suppliers. An effective listing form is one of the most important things to create an online marketplace and it will allow your sellers to put forward their offer on your platform. It's up to you to guide them by offering them a simple and effective offer creation process. The listing form must be understandable for your sellers and easy to fill in. In fact, listing on an online marketplace is a marketing strategy that gives sellers direct access to the wide, engaged audience and boosts their online presence. So, listings should be stand-out, the images must be polished and there must have unique, memorable titles and descriptions. Your sellers have to start by choosing the type of item, goods or services they want to sell or rent. For this they have to choose a category for their announcement. By defining in a clear and simple way the categories and sub-categories of products or services available on your marketplace make it easier for sellers while creating the listing form, but also for buyers when they search on your site, i.e. marketplace. It is important that your suppliers create their listing form in the right category so that buyers can find it. Buyers want to quickly find what they are looking for and only get relevant results. Apartments, house, villa, bungalow, etc. Accessories, shoes, bags, beauty, games, jewelry, clothes, etc. Editors, SEO experts, Developer, Graphic designers, etc. The sellers choose the category and subcategories for their listing and then determine the type of attributes or options available which will allow them to give more details about the product or service they want to offer. Therefore, when necessary you have to think of defining options to be informed according to the category chosen at the beginning by the sellers. Depending on the activity of your marketplace, you can offer more general and broader-scope attributes that can be valid for several categories of listings. According to the product category you choose, you will need to fill in details such as size, model, color, etc. A well-organized form plays a big role in encouraging sellers to fill it up. The proposal of object or services on your marketplace must be quick and easy. Make sure every step of the offer includes tips (context-sensitive help) and instructions to guide your sellers and help them optimize their listings. For product attributes, choose checkbox or choice options from a list. Indeed, text fields, even if they give more freedom to sellers to describe their offers, can also be a source of frustration when the seller is not inspired. Simplify their life by offering them instead checkboxes. The addition and modification of all the important features of a listing form must be clear and organized whose responses also have to be readable at a glance. Encourage your sellers to write a title that arouses buyers' interest and contains all the important elements to describe the object, such as the brand. This title should be explicit and sellers, as far as buyers see first. Pre or post moderation of listings will allow you to exercise better quality control, but also help your sellers improve their listing title. You know that a beautiful photo is better than a long speech. 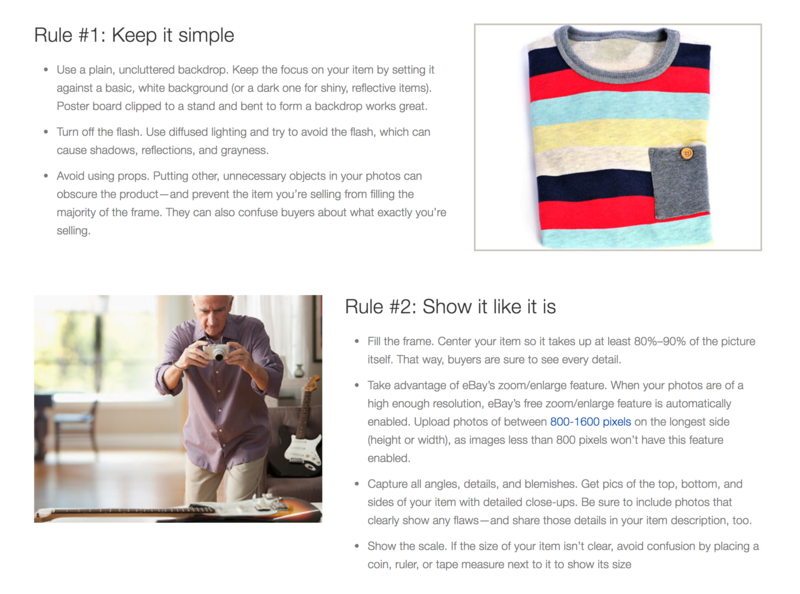 The key to success in e-commerce sales lies in the use of quality photos while listing. Quality photos allow buyers to get a better idea of the object on sale and make all the difference at the time of the purchase decision. So help your sellers showcase their products by showing their products in all its sides. Make sure you have zooming capability and sellers’ products look good on mobile devices. Make sure your sellers enter detailed product information in the field of listing form provided for the description. They must give here the list of the particular characteristics of the object, its advantages or its possible defects. In the case of a selling marketplace including used items, it is important that your sellers give details about the condition of the item, as this is an important criterion for buyers. The price terms requested from your sellers must be clear. Is it a unit price, a price per period, per portion, per type of buyer, etc? On this point, you can offer a guide to help your sellers to help them find a suitable price. In addition, if you want to buy a commission in your marketplace, remember to show the amount of your commission, so that the seller knows how much it will affect exactly after the sale of the object or service. Get free online marketing tips and resources to grow your marketplace and get to the top. Happy Customers all around the world are already building amazing marketplaces with Kreezalid. Stop delaying taking action on your idea and get real today! 14 day free trial, no risk and no credit card required.